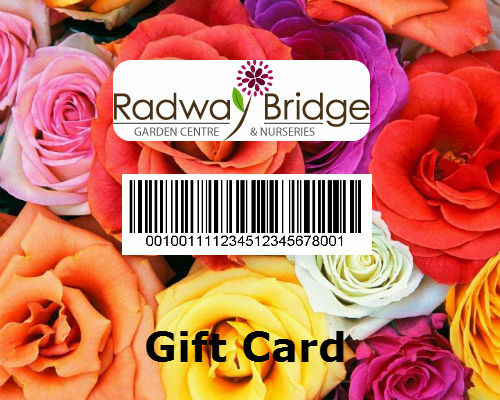 Celebrate a birthday, retirement, anniversary, a new home or simply say thank you with a Radway Bridge Garden Centre Gift Card. Radway’s gift cards are available any denominations and then used in store. We also offer National Garden Gift Vouchers supported by the HTA. 1. This gift card can be used as full or part payment for goods (excluding other gift cards) at Radway Bridge Garden Centre, Whitestone, Hereford. HR3 1RX. 2. No change or refund will be given but any balance remaining on the card may be applied to future purchases. 3. You can check you balance at any till or online. 4. Please treat this card as if it were cash as the balance cannot be returned to you if it is lost or stolen. 5. This card is not redeemable for cash. 6. This card will expire after 24 months of consecutive non-use (balance enquiries excluded) and the balance will be deducted. Cards with a zero balance will expire after 30 days. 7. Purchase of this card constitutes acceptance of the terms in the card holders’ agreement. 8. Card issued by Radway Bridge Garden Centre.